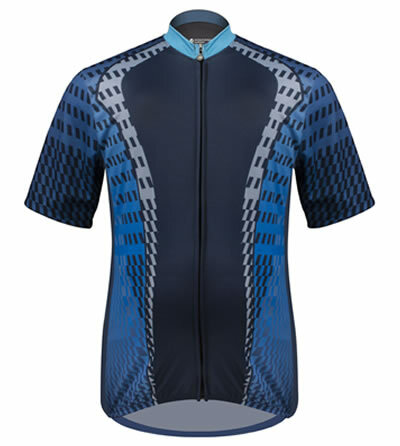 Man's Cycling Jersey - Stays Dry, Very Breathable. When cycling the tread of a tire makes contact with the road or ground leaving a mark. 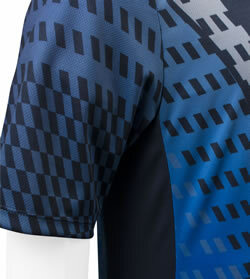 This jersey was inspired by treads that a bicycle tire leaves behind. We aim to inspire cyclist to "Ride Longer, and Feel Stronger." This jersey comes in colors and sizes for the whole family or group of cyclist. 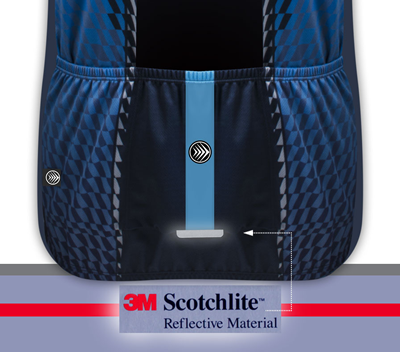 The 3M reflective tab is located under the middle back pocket keeps riders safe in dark riding conditions. These pockets are a functional classic design to hold anything a cyclist will need during their ride. The pockets are placed on the small of the back to prevent heavy loads from sagging or touching the bike saddle. 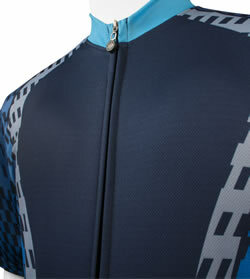 The full length zipper makes this jersey perfect for hot or cool weather. Aero Tech's 100% Polyester WickAway Fabric is technically designed to keep moisture off the skin. The gripper elastic around the bottom keeps the jersey in place and reduces friction in the wind. The arms of the Jersey are designed for the cycling position leaving your arms relaxed and comfortable. The back of the jersey is longer than the front for the seated position on the bicycle. When a garment fits correctly it becomes invisible and attention can be focused on the joy of cycling. 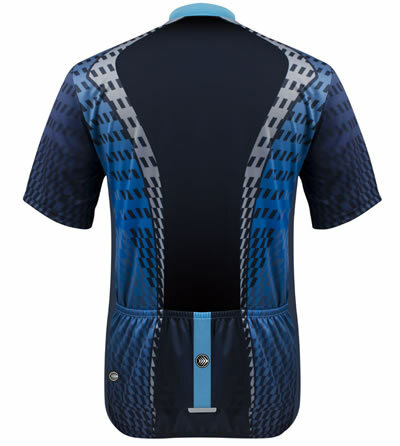 The background on this elaborate cycling jersey is from bicycle tire tread. Our talented designer, Tamara created this awesome collection for the entire family. Inspired by the many "matching" families who ride together. We wanted to create a unisex design that could be worn by men and women and children. This garment is sold in all sizes for the entire family. We are making this print available in all our sizes. 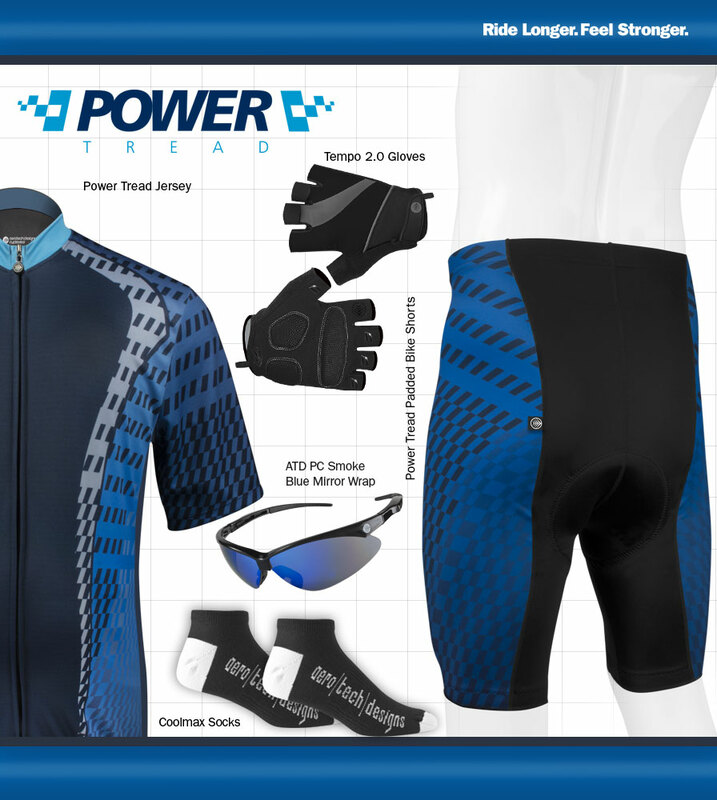 This plus size jersey will look great on a solo cyclist or a tandem couple, even a group of family riders with children can all show up at their cycling event with this special blue tire tread garment.